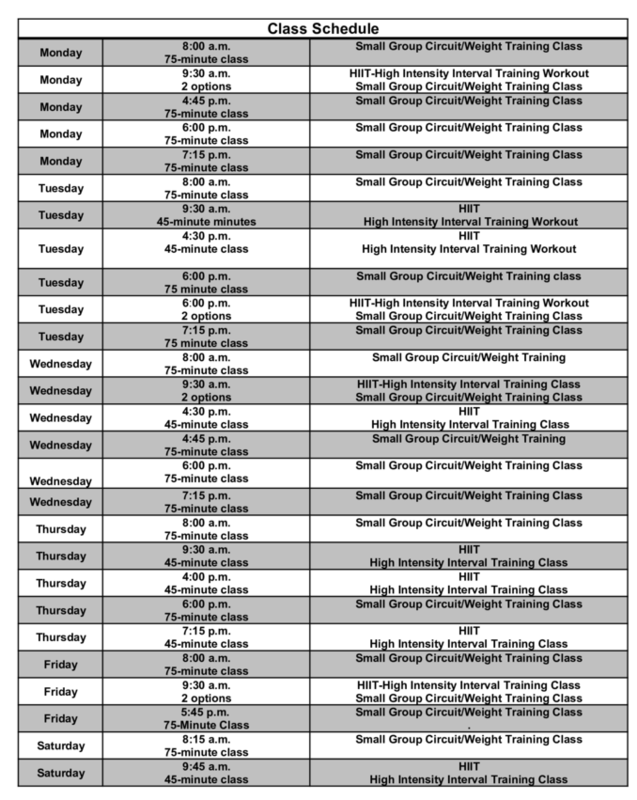 Our 75-minute functional fitness classes fill quickly and we work on client retention. So, if you cannot get into one of our established group training sessions – ask about all of the options! Add a dose of high energy and motivation to your workouts with group personal training classes. Small Group Personal Training at Class Action Fitness Inc. offers you the benefits of having your own trainer...at a fraction of the cost of private training. And perhaps best of all—It’s FUN!! Each workout is based on scientific exercise progression and sound physiological principles. Within weeks you’ll notice a difference in your strength, your energy, and your overall fitness level. Workout one or more times a week with a small group (8 people max) and a trainer to lead you through a challenging, full body weight training workout that will get your heart racing, your blood pumping, and keep your motivation levels high! *Heart Rate Monitor Training - designed with your personal heart rate training zones. Don’t spend countless hours working out without a plan. The HRMT allows you to come into the gym and learn how to use a heart rate monitor correctly. You will be guided through your workout with a personal trainer every time. You will need to come into Class Action Fitness, Inc. and have your Exercise Metabolic Test done. Each participant is given a 12 week cardiovascular training program that is personally designed with their heart rate training zones and training goals. HIIT WORKOUTS - 45-minute class will include a structured warm-up to get your body ready for the High Intensity Interval Training Class. High intensity exercises will be used to boost your metabolism, burn fat, add lean muscle, increase strength and improve your cardiovascular fitness level. Your workout may include Kettlebells, TRX, Slam Balls, Medicine Balls, Rebounder, Punching Bag, BOSU Balls, Stability Balls, Penalty Box, ViPR, Jump Ropes, Battling Ropes, Elliptical, Treadmill, Stairmaster, Rowing Machine, Ski Machine and Versaclimber. This is the time for me to think about my body and what it can do.